When thinking of the city of Boston, MA a few things come to most people’s minds: the Red Sox, cold weather, clam chowder, the word “wicked”, and, of course, that horrible Boston accent. For those of you who may be unaware of this accent, it’s the same one that has been pouring out of TV’s for the past year thanks to DISH’s ad campaign for the Hopper. 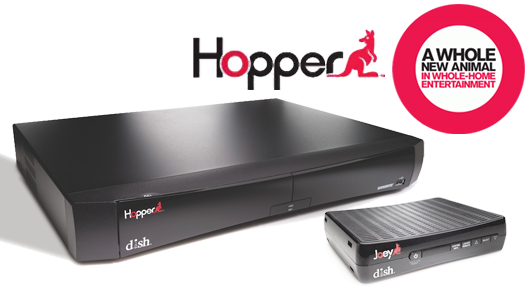 In January 2012, DISH Network released their new DVR system known simply as the “Hopper.” The system allowed viewers to record up to 6 shows at the same time, included AutoHop, which would let you skip over commercials, and had a program called PrimeTime Anytime, which allowed the owner to record every primetime show from the four major networks for eight days. The commercial was such a hit that DISH decided to make a whole series of commercials featuring the Boston Guys. The commercials spread like wild-fire and soon everyone was talking about the Hopper. This campaign ties into Kenneth Burke’s theory of dramatism. In all of the commercials the agents and the scene are the same. The commercials all contain the Boston Guys and always take place in their house. On the other hand, the act, agency and purpose continually change. This past January, DISH improved the Hopper by adding Sling technology, which allows customers to view the shows they recorded on mobile devices. DISH decided to bring the Boston Guys back for the new version but slightly shook up the campaign. In this campaign, the agents still stay the same and the act, agency, and purpose still differ with every commercial, but now the scene changes as well. The campaign takes the Boston Guys out of the house to show how the new sling technology works. So far, this years campaign has been just as successful as last years. Multiple commercials featuring the Boston Guys have come out since the campaign started in January, and as of now, the campaign shows no signs of slowing down. All we can do now is wait and see where DISH takes the Boston Guys next. I just checked out some more of these ads and they’re pretty funny and effective! Every other cable and satellite provider out there has a DVR and usually an ad campaign to go with it, but Dish gives it a name and has fun with the Bostonian stereotype too. These ads give the Hopper personality. Your analysis gave me a little more understanding of dramatism and how ad campaigns keep a common theme but change things up a bit. I think that it’s interesting that right as I read your post title and saw the picture, I smiled because I knew exactly what you’re talking about. I definitely think the campaign has been a success. Even though I don’t know much about DVRs, I can hear the Boston accent and see the kangaroo and know that’s exactly what you’re talking about. The company has definitely succeeded in getting their name out there through dramatism. First regarding the dramatism theory the commercial was on point with identifiying the product, they jsut repeated the name of the product numerous times, but in a humorous way, by using the heavy Boston accent. I had never seen that commercial before, but I have seen newer ones of the Boston guys. It just shows how branding works. They story keeps going and people wish to follow to see what happens next. It’s not even about the product more, it’s about the characters. You make some really interesting points throughout this post, and these commercials are some of favorite airing on T.V. today. I think DISH advertising ideas are working very effectively. It is keeping the same characters, and still appealing to the public. From my understanding this is difficult to do in advertising. So, congrats DISH. It’s amazing the power a successful advertisement has to bring interaction between viewers. Since television advertisements first dawned, it has always been a favourite past time for viewers to share and enjoy advertisements which are ‘out of the ordinary’ or just a little bit quirky. This ad is a perfect example of that! A similar advertisement, played nation wide in Australia during 2005 is this one for Carlton Draught Beer. For a long time there were Facebook fan pages of this ad, people creating their own mock version of the commercial and then ‘group chanting’ the theme song while drinking beer in pubs became an acceptable and well recognised social trend. So before we think that advertisements are just the product of men in suits trying to sell us something, think about their social impact on popular culture and begin to enjoy! I think the “Hawpah” commercial series is a great move for the Hopper. Choosing one group of characters that can consistently grow with the product is good from a marketing standpoint because when people see these Boston guys on TV they automatically know that a Hopper commercial is coming on. I also think choosing people with such a thick accent adds humor to the commercial which is also desirable when watching television, especially commercials. Since the Hopper allows people to skip commercials, do you think that they allow their own commercials to be skipped? I wonder how it impacts the success of the commercial in general.